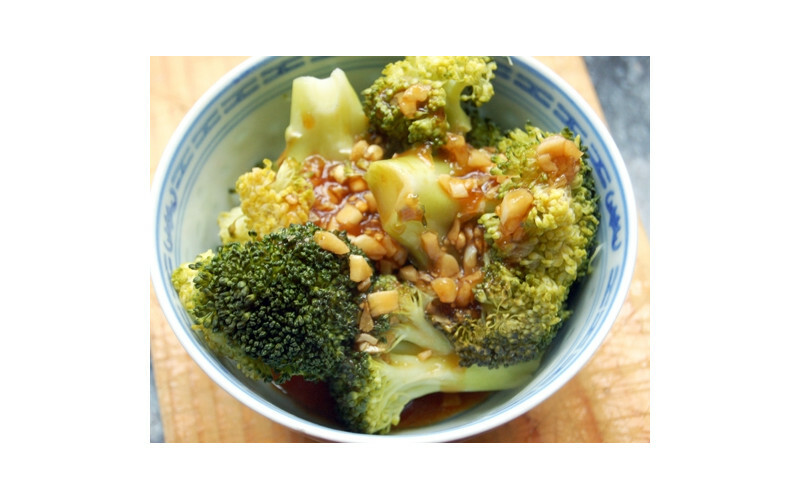 Serving broccoli with this garlic and soya sauce really is a lovely way to eat it, especially if you steam the broccoli. Enjoy with tofu or fresh soya beans with brown rice or other wholegrains. 1. Prepare and steam your broccoli for 5 mins, so it remains crunchy to the bite. Boil it gently in a little water with the lid on, if you don't own a steamer. 2. Meanwhile, heat the oil in a small saucepan, then add in the garlic, stirring it on a medium heat until it begins to soften. 3. Then add in the stock, soya sauce and sugar and stir. 4. Put the cornflour into a small bowl and mix it into a paste with a splash of water. Then add this to the saucepan with the other sauce ingredients. 5. Stir the sauce, turn the heat down and allow it to thicken. Add more cornflour or water to reach the consistency you like. 6. Serve immediately over the broccoli.